Female, born in 1955 in Changchun, Jilin, China. Graduated from Art School of Anhui College of Arts and Crafts in 1975. Furthered her education at Prints Department of China Central University of Art. Her work was exhibited at many art exhibitions at national level and was included in professional publications such as The Collection of the 12th Prints Exhibition, Art of Prints, etc. 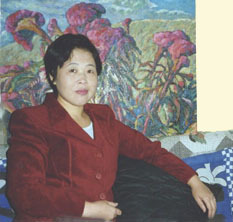 Her work has become the collection of museums and galleries in Hong Kong, Shenzhen and Shanghai. She has been included in several Who's Who in Arts and Crafts. "In Chinese, 'FAN' means sail, and 'WANG', ocean! So 'I am Sailing on an Ocean' ..."